“Rendang” is a type of stew that tastes like curry, but with a tangy flavor as tamarind juice is used to create that slightly sour taste. 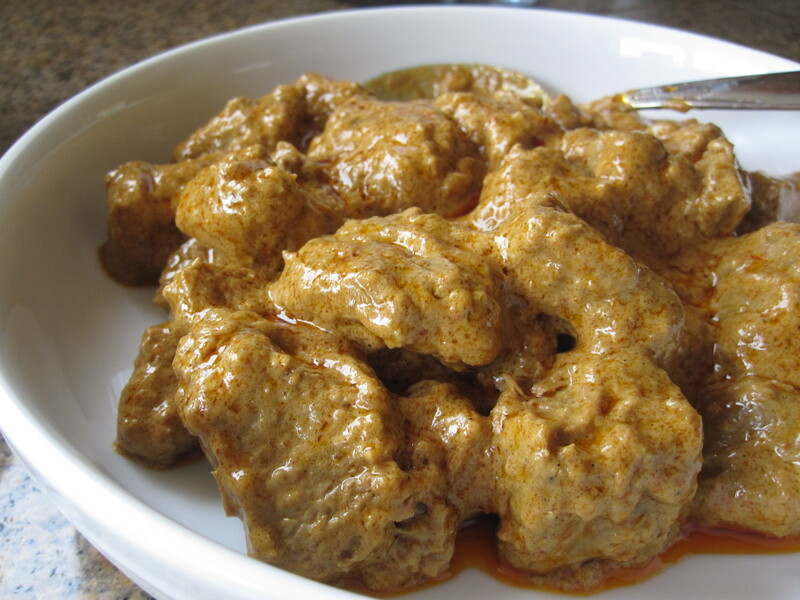 If you use chicken then it is called rendang chicken, use beef then it becomes rendang beef. I have made rendang chicken before with spice paste made from scratch. It was very delicious, except it took a good 30-45 minutes to cook the spices paste which kinda of drives me away sometimes when I just don’t have the time for it. 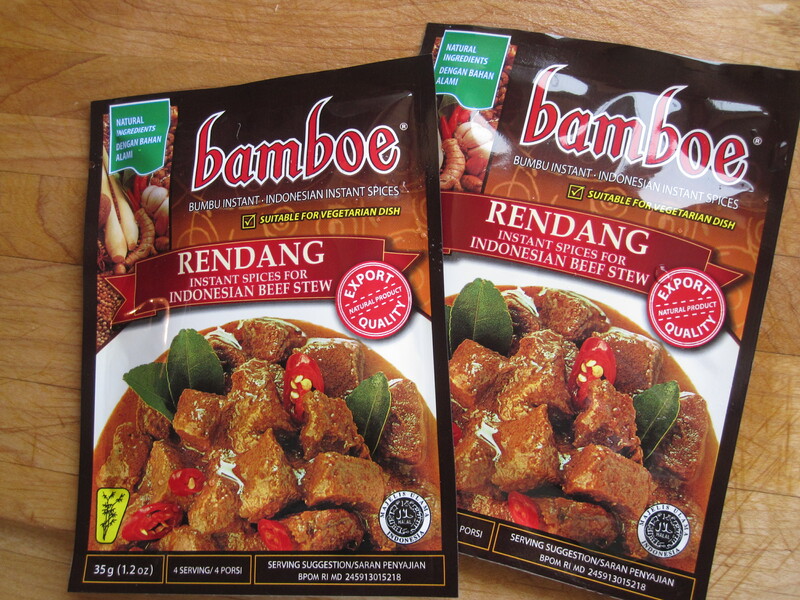 Now, the problem solved with the help of “bamboe” brand rendang instant spices paste. One of my Chinese drawing classmates made rendang beef with instant spice paste for our potluck gathering last year, and it turned out very delicious– the sauce was rich in flavor and the beef was very tender. I finally tried out the instant spice the other day; it was very easy indeed as per instructions. All you need are cut beef chunks, instant spice paste and coconut milk, nothing else– not even salt! And yet, the result is very promising restaurant style gourmet food that will impress everyone. Try it out for your next potluck. Cut beef into bite size chunks. Boil beef in a large pot along with 3-4 slices of fresh ginger (optional– to remove any beef meaty smell). Be sure there is enough water to cover the beef during boiling. Cover and cook over medium heat for at least 1 hour, until the meat is tender. Remove beef and discard ginger. Put beef, instant spices paste and coconut milk in another pot. Stir the sauce to blend well. Cook over medium heat, uncovered and stir occasionally, until the sauce thickens to a gravy stage– at this point there will be oil forming from the bubbling sauce and the sauce looks like spicy oily mud (if you cook longer there will be more oil (from coconut milk) forming). Serves hot with steamed rice. Beef: I like to use beef tri tip cut as it has some marble fat, but you can also use beef cuts for stew. Spiciness: The spices paste is not spicy at all. I have to add 1-2 tbsp of homemade sambal chilli sauce to make it a little spicy.